Pet Shop Boys have made a surprise appearance on Radio 4's rural soap The Archers. 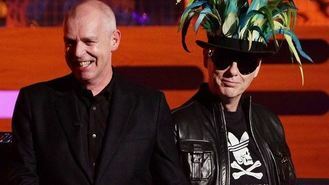 The pop duo - Neil Tennant and Chris Lowe - arrived as last-minute headliners for the show's music festival Loxfest after the original act dropped out. Listeners heard festival organiser Roy Tucker reveal the news backstage as village landlady Jolene Archer belted out a version of Dolly Parton's song of her name. The duo, whose hits include It's A Sin, Go West and Heart, said: "It's a thrill for us to enter the world of The Archers, the UK's most famous radio drama." They are joined on the show by Radio 6 Music DJ Steve Lamacq, who is heard organising the festivities of the fictional festival. He said: "Loxfest is the Archers storyline we've been waiting for. As someone who spends a lot of time covering festivals for the BBC, it was one we really wanted to be involved with. "So when we first heard the rumours about the festival at the start of the year we offered up our services, helping to suggest bands that might fit the bill. I'd have probably have gone down and helped them put up the security fencing if they'd asked. "I've been a fan of The Archers off and on for more than a decade, but got hooked again about three years ago. You'd be surprised how many Archers fans there are in the music industry. Even the former stage manager at Reading Festival would come up to me and ask to borrow my pocket radio when the Archers omnibus came on." The Archers, which started out as an educational programme for farmers, is recorded in Birmingham and set in the fictional nearby village of Ambridge. Previous guest stars include the Duchess of Cornwall, Princess Margaret and Sir Bradley Wiggins. Ed Sheeran is now the proud owner of a major American music award but said shows in the USA are tame compared to British ceremonies. Beyonce was the toast of the MTV Video Music Awards, as stars lined up to pay tribute to the biggest winner of the night. Miley Cyrus let a homeless man accept her award for video of the year for Wrecking Ball at the MTV Video Music Awards . Beyonce was embraced by her husband Jay-Z and daughter Blue Ivy as she was presented with the biggest honour of the night at the MTV Video Music Awards. Snakes and stage slips: There's drama and the MTV Video Music Awards haven't even begun yet. David Guetta has claimed his fifth UK number one single with Lovers On The Sun featuring US singer-songwriter Sam Martin. Iggy Azalea has tumbled off the stage during an MTV Video Music Awards benefit concert. Morrissey's new album has apparently been removed from iTunes in America.